If you’re having a wedding it’s most likely because you want to share the event of your marriage with the important people in your life. In order for them to be there, it is important to notify them of the date well in advance, giving them ample time to plan. Enter: Save the Dates. Traditionally printed on card stock, magnets have become a popular option and for good reason – it is a keepsake for your guests that will last as long as your love. While some people may question the need for a Save the Date, it is a nice courtesy, especially for those guests who will need to make arrangements for travel and lodging, or whose schedules include weekend work shifts or other frequent commitments. It is especially important to notify guests ahead of time if your wedding is being held on a holiday weekend. Even though your invitation will include all of the pertinent details, your Save the Date should let people know both when and where your wedding will be taking place. This is also a great opportunity to provide guests with your wedding website address, if you are using one. Ordering your magnets through your stationary provider is a great option. This ensures that you can get a Save the Date that coordinates with your invites, as well as providing an envelope, possibly even addressed, saving you time. Along with the invitation, this will help set the tone for your wedding. Colors, font, and visuals all clue guests in on whether you’ll be going the formal route, or a little more casual. While a magnet can easily include simple text, the most popular feature a photo of the couple. This is a great opportunity to share a picture from your proposal, or even just a favorite of the two of you. While any Save the Date you send along will most likely be hung on the refrigerator, using a magnet not only ensures that this is the case, but makes it much less likely to be lost in the shuffle. In this high traffic area, it’s seen often, giving your guest a reminder of the important date prior to your wedding, and jogging their memory of the event once it’s past. 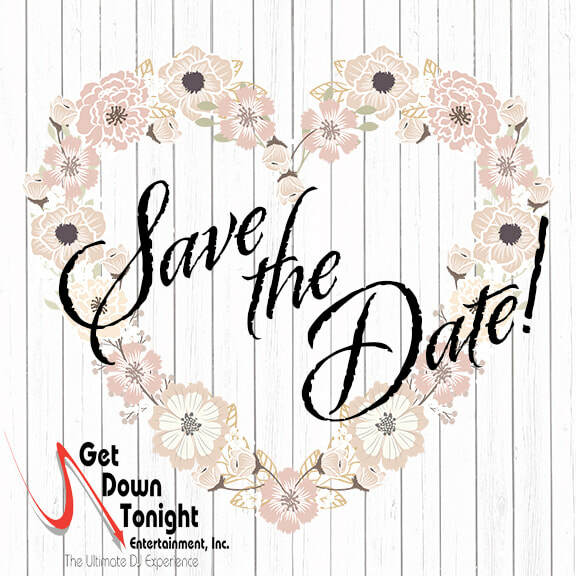 Save the Dates are offered through the Get Down Tonight Entertainment, Inc. and Carlson Craft using the following link: https://getdowntonight.carlsoncraft.com. Get Down Tonight Entertainment, offers 15% OFF of Carlson Craft Products, so take advantage of this great deal!! !